Born in the deep South, I was raised to be small, quiet, polite and inauthentic--“the perfect southern belle.” I always knew I didn’t fit that mold, and always was being told I was too loud, headstrong, and selfish. For most of my life, I did what was expected and fulfilled the roles others defined for me. Fast-forward, and I was living a fabulous life with everything a woman could want, yet something was missing. The role I was playing wasn’t authentically me. I couldn’t deny my feelings anymore. One day, something deep inside began to rumble and roar, slowly but loudly. What was this need to break free, spread my wings, find my voice and boldly express myself to the world? What was waking up in me? I was just itchin' to crank life up a notch, claim my passion and find the juiciness missing in my life. Well, folks, it was what I fondly refer to as the “Rebel Belle,” my soul and inner “BellePower” screaming to break free. So, the Rebel Belle was unleashed as I set out on the road to freedom and self-discovery. 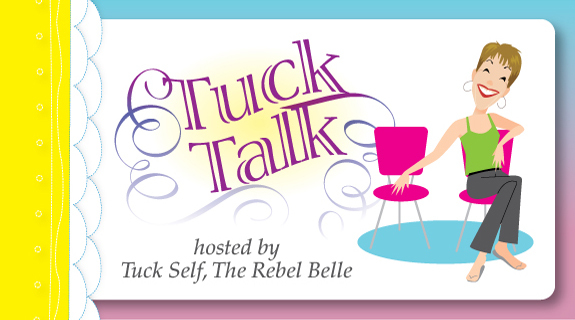 Welcome to A Li'l Tuck Talk: Enthused, Ballsy & 'Rebelicious'! Conversations with The Rebel Belle inspiring you to trust your power, own your voice and share it with the world - full tilt boogie and on your terms! Click Icon for the latest 'Tuck Talk': A Li'l T.L.C. from The Rebel Belle: Transformation, Liberation & Celebration!